There isn’t a day that I am out with my dogs that some one doesn’t asks “What is THAT?” or I will hear some one whisper as they pass “that’s a psss psssps!” Some people ask if our dogs are Portugues Water Dogs, Curly Coated Retrievers, Soft Coated Wheatens, some type of Spaniel… the list goes on. I always smile as they try to guess. Then I usually answer YES. I watch their eyes grow with interest because they can’t believe that they guessed it right! Then I lean in and tell them that they were really only about 1/10 correct. 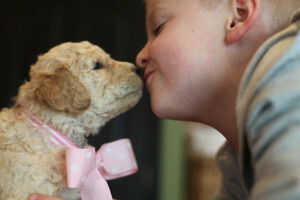 It is believed that the Australian Labradoodle is actually a mix of nearly 10 breeds. It is this unique mix that contributes to their non or low shedding coat, laid back personality, love for all things and exuberance. 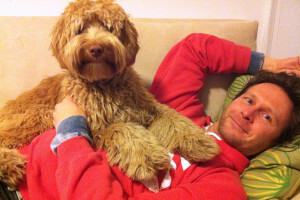 Some still are very confused about what a Labradoodle really is. Some think that the mix is purely a blend of the Labrador Retriever and Standard Poodle. I often try to explain the difference between the Australian Labradoodle and the Lab Poodle mix. The Lab Poodle mix unfortunately sheds horridly, they are generally very large and have an enormous amount of energy. Some will ask me about the Golden Poodle mix too, having been around several Golden Retrievers growing up I noticed two things more so than anything else~ they shed more than any other dog I know and they have a musky oil smell to their coat. The Golden Poodle mix takes on a lot of those characteristics and like the Lab Poodle mix is a huge dog full of energy that sheds. The Australian Labradoodle gets it’s name because it was originally bred in Australia not because its mix includes such breeds as the Australian Cattle Dog or the Australian Sheppard. The mix was originally bred with the purpose of producing an allergy friendly breed that could also serve as a seeing eye dog. Several litters were bred but there were many disappointments as the early generation cross of the Lab and Poodle did shed. The research was abandoned but all was not lost. A mother and daughter team in Australia stepped in, believed to have experimented with breeds such as the Curly Coated Retriever, Portuguese Water Dog, Irish Water Spaniel and several other breeds; some litters were a success and some where not. The Irish Water Spaniel and Curly Coated Retriever were two breeds that brought in diversity but also produced shedding coats. 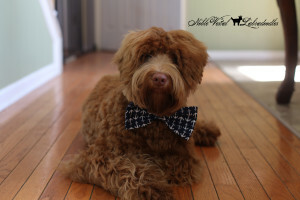 After many years and careful mixing the Australian Labradoodle as we know it today is a people pleasing, loving, laid back companion that sheds about as much as you and I. They can be found in three sizes: mini, medium and standard. With coats ranging from wavy to curly. In rich reds, chocolates, velvety blacks, cool cremes and golden apricot.